Do you want to see the Northern Lights? Then get out of the city and join us on our Aurora Chaser Tour! We provide you with the best conditions to chase the Northern Lights in 3 different ways – on foot, by boat and by coach. During the day we explore natural wonders in a land of fire and ice. Winter fun activities include a glacier hike in South Iceland, bathing in the Blue Lagoon, walking in a lava field, entering Iceland’s longest ice cave, a snowmobile tour on the glacier and northern lights expeditions with torches. 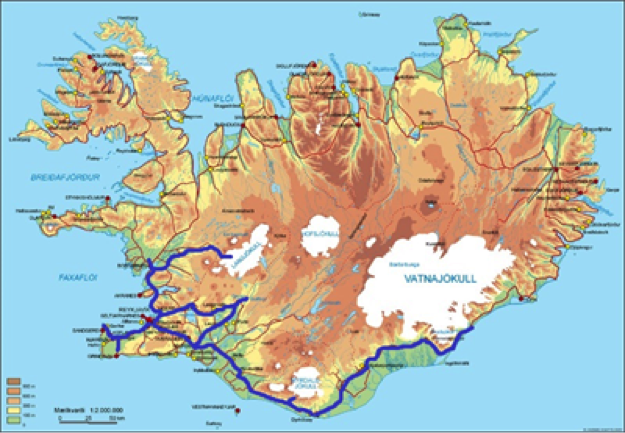 We travel to West Iceland, tour the Golden Circle and the amazing South shore route. We visit Vatnajökull national park and Jökulsárlón glacier lagoon. You see classic Icelandic highlights but we unveil many hidden secrets of an Icelandic winter wonderland, while the long evenings are dedicated to the Northern Lights. INFORMATION REGARDING DINNERS AND LUNCHES: In Reykjavik on arrival day the dinner is on your own. There are many restaurants for both fast food and a fine a la carte dining in Iceland's capital. In the countryside, a 2-course dinner is included on day 2, 4 and 6. Lunch is included on day 4. A 3-course farewell-dinner is included at Perlan revolving panorama restaurant (day 7). If you have any special diet requests or allergies, please let us know at the moment of your booking. Lunch stops are made at small country restaurants or petrol station diners. Individual transfer by Flybus shuttle bus from Keflavik Airport to Icelandair Hotel Natura in Reykjavík where you spend the night. We provide you with ideas how to explore Iceland's capital on your own. Dinner suggestions as well! At 09:00 meet your tour guide and explore the Reykjanes peninsula with its many unusual geological features and moon-like landscapes. We stop for 3 hours at the famous Blue Lagoon for a soak in its warm geothermal water. We continue to the Reykjanes folk & maritime museum, located in a natural paradise, showing items which were essential for the livelihood on both land and sea. Next door to the museum are two beautiful light houses, surrounded by amazing ocean view. During the two hours journey to West Iceland our expert tour guide provides you with information about the Northern Lights and teaches you how to take photos of this natural phenomenon. Stay 2 nights Icelandair Hotel Hamar, near Borgarnes in West Iceland. After a 2-course dinner, join a torch walk into the darkness, soak in the hotel's outdoor hot tubs and check if the Northern Lights are visible. These spectacular sky-light shows are also known as the Aurora Borealis and are frequently seen in Iceland from September through April on clear and crisp nights. White and green are usually the dominant colours of Northern Lights but sometimes there are considerable color variations. They are ephemeral, however, sightings are not guaranteed. Today we take you by bus and an 8-wheel drive monster truck to Langjökull glacier, Iceland's second largest glacier, for a once in a lifetime adventure deep inside one of the world's largest man made ice caverns. The caverns are composed of an extensive system of tunnels and chambers that stretch close to 300 metres into the solid ice cap towards a breath taking natural ice cave at the heart of the glacier. Making your way inside the glacier you are able to explore various nooks and chambers and see a huge ice crevasse. As you walk further along the tunnel, the ice gets older and its colour gradually changes from white to deep-blue. We also explore Borgarfjörður which is known as the Saga valley because of its many important historical events. We get a chance to visit Deildartunguhver, Europe's most powerful hot spring which produces 180 liters per second of water that is nearly boiling - 97° Celsius. Hraunfossar is a series of waterfalls pouring from beneath a wide lava field. Barnafoss – the Children's falls, is nearby with its own tragic tale. In the evening, we step into the hotel garden in search of the Northern Lights followed by relaxing in the geothermal outdoor hot tubs and a hot cup of chocolate or tea. Today we travel along the Hvalfjörður fjord. The first stop is at an Icelandic wool outlet store, just to see what they do with all those sheep! We continue inland to Þingvellir National Park, a UNESCO World Heritage site and stop for a wellness retreat and lunch at the Fontana thermal baths. We travel the Golden Circle route and see steam rising from the Geysir geothermal fields as we arrive. There is a variety of hot springs and bubbling pools. The original geyser is now dormant but has been replaced by Strokkur "the Churn" which erupts at 5-10 minutes intervals. On we travel to Gullfoss, a double waterfall that tumbles 34 meters into the Hvítá river and attracts tourists and travellers in summer and winter. Overnight and dinner is at Hotel Gullfoss, a small countryside hotel in South Iceland. Tonight, we search for the elusive Northern Lights by snowmobile (two persons sharing a snowmobile), and experience a Viking winter wonderland amidst the peace and stillness of rural Iceland. Today, we take you out along the South coast. The first stop is at the explosion crater called Kerið which is filled with water and resembles an ancient amphitheatre. We continue to Skógafoss waterfall which is 60 meters high and one of the most impressive waterfalls in the country. In the afternoon we take you on a glacier walk. The Sólheimajökull glacier tongue extends from the great Mýrdalsjökull glacier, down to the sandy plains of the Icelandic south coast. The spectacular surroundings are marked by rugged and majestic rock formations thoroughly shaped by the glacier. On this fun, safe and easy to moderate glacier walk you get to explore the wonderland of ice sculptures, water cauldrons, ridges and deep crevasses on the breath-taking Sólheimajökull glacier. While enjoying all the features of the glacier and its spectacular surroundings, you learn more about the behaviour of glaciers and their impact on nature. No technical requirements are needed for the tour as an experienced glacier guide teaches you how to use basic glacier equipment, such as crampons and an ice axe which are provided for glacier walk tours. Duration of this activity is about 3 hours in total, about 90 minutes on the ice and about 30-40 min walk (one-way) from the parking lot to the glacier edge itself. Minimum age for the glacier hike is 10 years. You need to bring warm clothing, rain gear and hiking boots. Stay 2 nights Icelandair Vik in South Iceland. After a 2-course dinner, join a torch walk to the black lava beach and look out if the auroras are across the sky. Today's program is all about glaciers, ice and icebergs. A long drive brings us to Jökulsárlón, a glacial lagoon filled with floating icebergs, and we explore the extraordinary site and might see seals swimming in arctic waters. You can walk on the black sandy beach where large icebergs get stranded. In the afternoon we spend time at Europe's largest national park, which has Iceland's highest mountains, an alpine environment, and Europe's largest glacier. 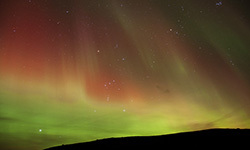 In the evening enjoy a film presentation about the Northern Lights as part of the Northern Lights educational program. Beware of not going to bed too soon or you may just miss out one more chance of seeing the Northern Lights shimmering and dancing across the night sky. From Vík we travel to Reynisfjara, a black lava beach with high bird cliffs and pounding waves. Further west we reach the high but narrow Seljalandsfoss waterfall which plunges from the mountain. In the afternoon we return to Reykjavik for a short city tour and some leisure time to explore Iceland's capital on our own, visit museums, do some shopping or simply rest after all this touring. Farewell dinner at Perlan Panorama restaurant, followed by a 2-3 hours Northern Lights hunt by boat to escape from the city lights. Around midnight we return to Icelandair Hotel Natura for one last night.